At 40 MPH, three feet is not a lot of room. Well, maybe there is no need for such drama. I took this photo five years ago as a personal assignment. I wanted to illustrate how it feels to ride a bicycle on a busy city street. The California Bicycle Coalition asked if they could use the photo as part of their campaign to pass a law requiring drivers to give bicyclists three feet of space on a roadway. Of course, I agreed. This week Governor Jerry Brown just signed the “three-foot” legislation, Assembly Bill 1371. The bill is not heavy-handed; it has a base fine of $35. I’m also guessing that most drivers won’t change much of their behavior because of AB1371. After all, we’ve had laws on the books for decades about stopping at a stop sign, yielding right of way to pedestrians and, more recently, no texting while driving. If you look around, you’ll notice that these laws aren’t always followed by some drivers either. At least there’s a law now. If you’re interested in knowing how this photo was taken, it was pretty simple. 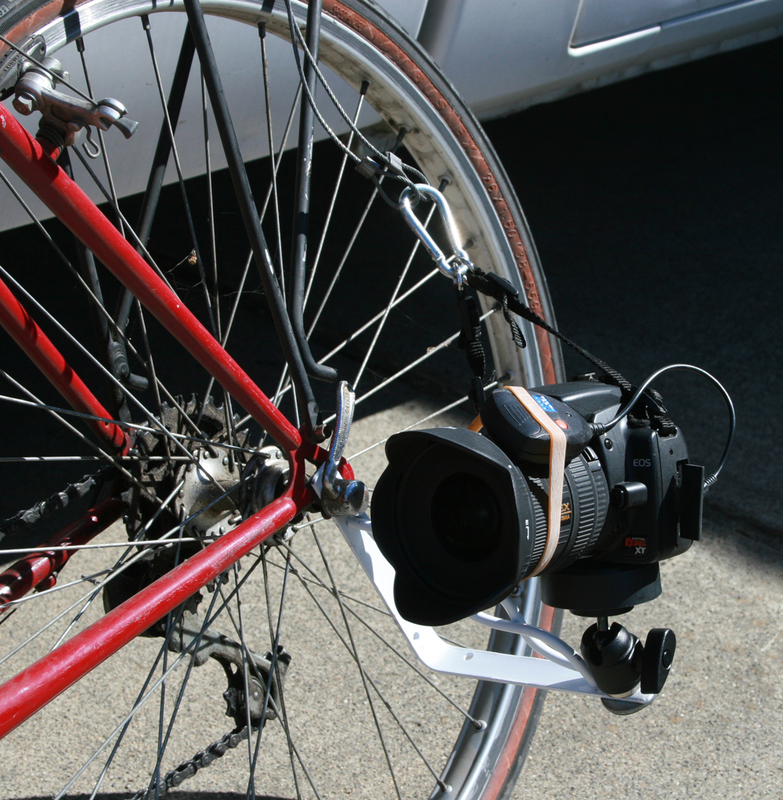 I modified a shelf bracket to mount a small DSLR camera onto the rear axle of my bicycle. I used a 10-20mm lens for a very wide perspective, set the shutter speed to 1/30 second for some blur effects, and used a small radio remote to fire the camera while I navigated in traffic. After about 250 shots, I found at least one good one (above). 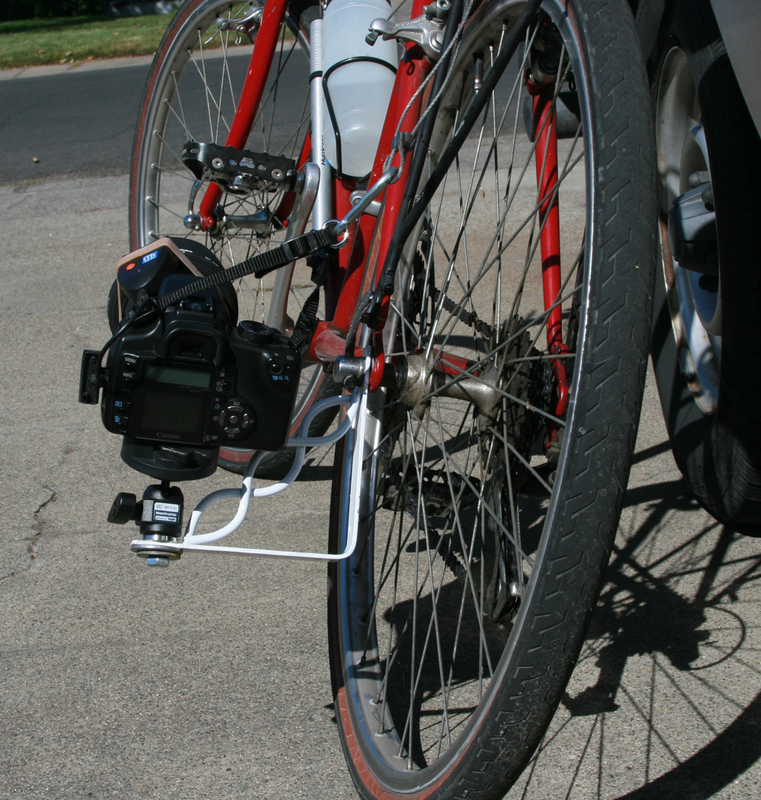 I mounted my DSLR camera to the bike frame with a modified shelf bracket and a ball head. I used some safety cables to keep the camera from bouncing down the street. It never came loose. Nothing like a crunchy aphid for lunch. At the end of the movie, “Wizard of Oz,” Dorothy says that if she ever goes looking for her heart’s desire again, she won’t look any further than her own back yard. 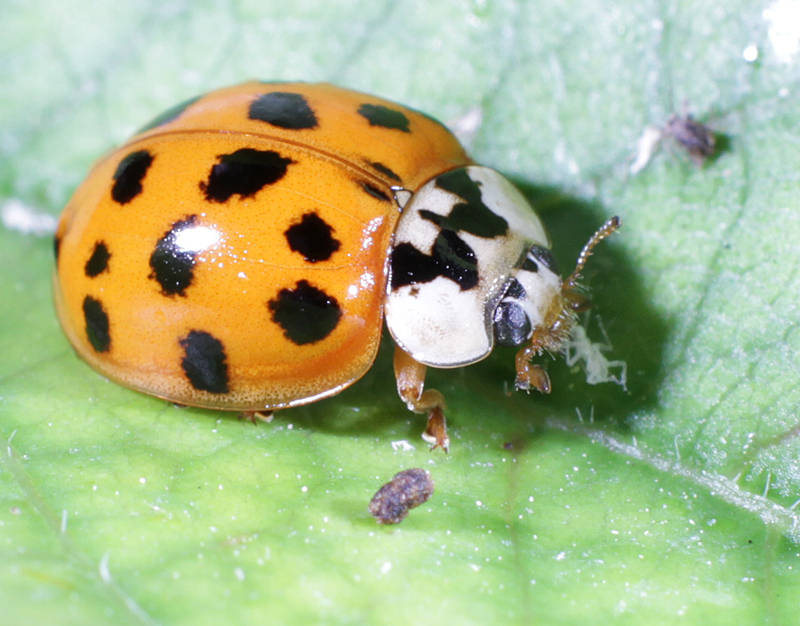 A couple weeks ago I put out a call asking for the best place to find ladybugs. I wanted to take some closeup shots and I knew this was the time of year for them. I got several suggestions, most of them fell into two camps: 1) drive way the heck up into the hills, or 2) buy a bag of them and wrangle them myself. Instead, I took Dorothy’s advice and looked in my own backyard. Our fruit tree is heavily infested with aphids so it made sense that I would find ladybugs in the tree. Sure enough. As I got closer to the tree I could hear the faint cry of aphids being devoured alive (and dead). Don't bug me, I'm busy. 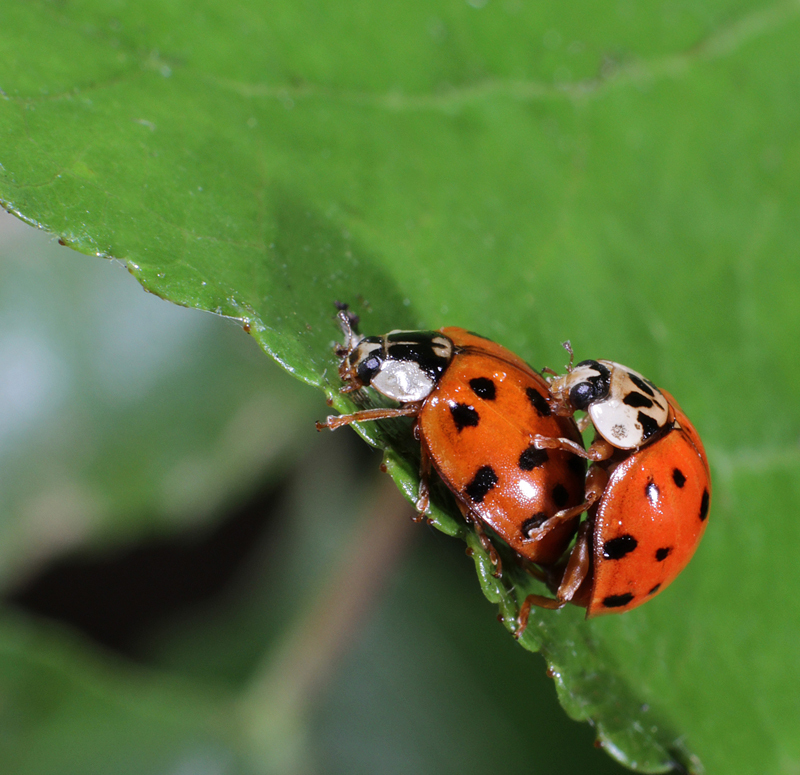 This photo raises a question: What do you call a male ladybug? I learned the answer is: a male ladybug. Gear talk: These photos were taken with a Canon 7D, 50mm f1.4 lens on a 20mm extension tube, and two Nikon flashes (left and right side). (ISO:100, 1/200, f/11) The camera and flashes were mounted on a home-made bracket (natch) that is pretty mobile and well-balanced. I can get more magnification by using a longer extension tube. Focusing at this magnification is very critical, depth of field is about 3/8 inch. 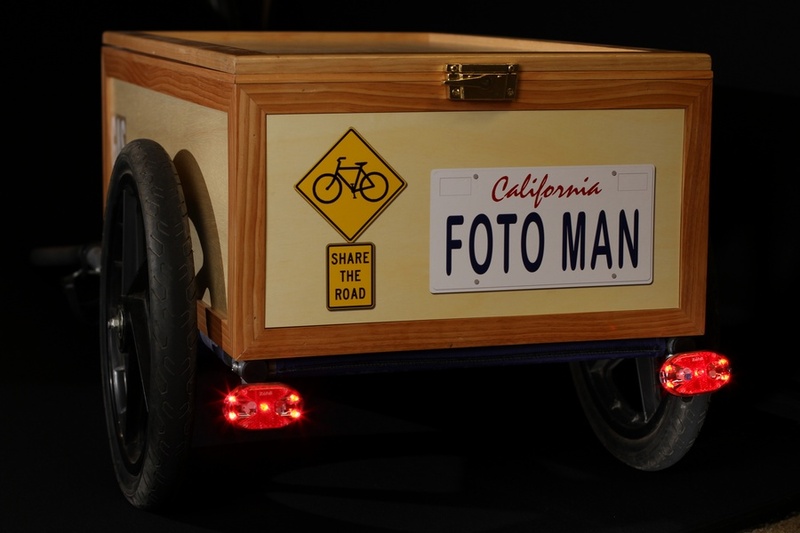 My custom cargo trailer helps me use my bike for photo jobs. 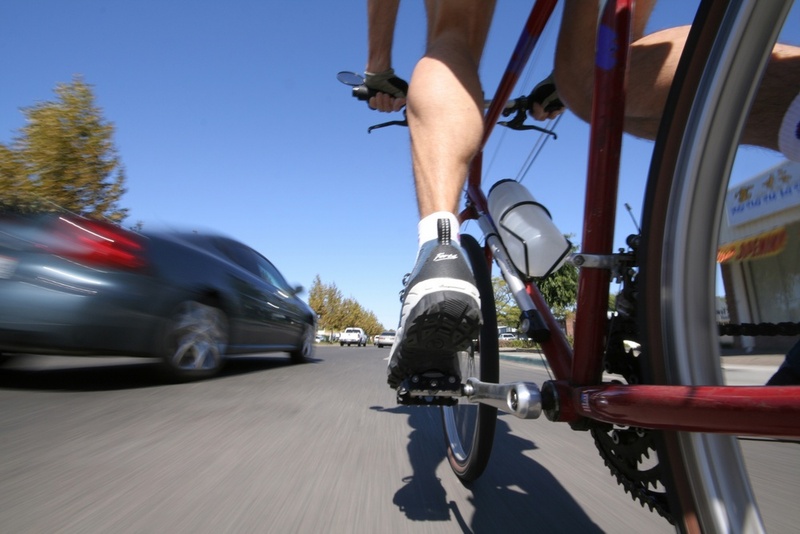 The month of May is officially designated as Bike Month. Several events throughout the city help raise awareness of bicycling for commuting, recreation and exercise. I am committed to find more ways to operate my photography business on two wheels. It’s not just the recent rise in gas prices that motivates me; it is much more than that. I’m interested in getting some good clean exercise. I’m interested in conducting my business in a way that attracts like-minded people…clients who appreciate the extra effort and commitment it takes to use a bike. 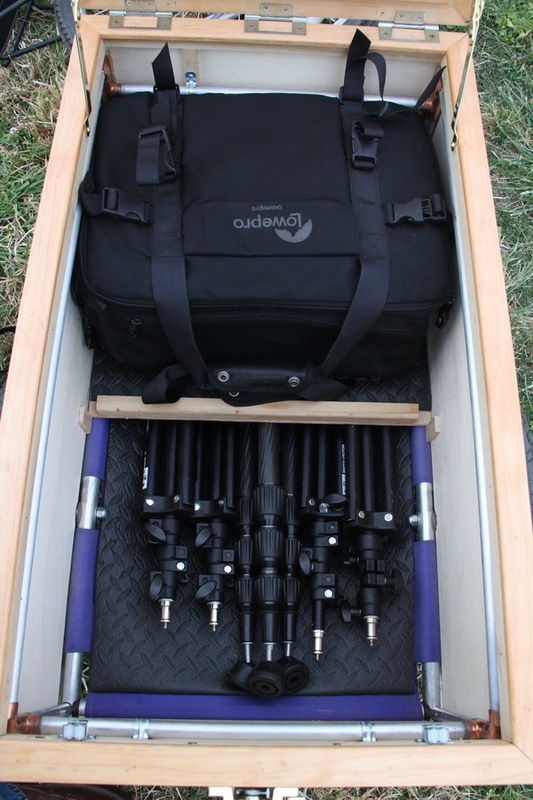 And to expand my range, I can carry quite a bit of photo gear if I add two more wheels, as in using a bike cargo trailer. I bought a used Burley bike trailer last summer at a yard sale for $20(!) and spent some time over the winter building my custom gear trailer. The wooden box is very light, and the design gives me flexibility for arranging the cargo space. A partial platform leaves space in the lower section for light stands, umbrellas and a tripod. The rest of my gear rides on the top of the platform and a latch on the lid keeps it all in place. The smaller format of the trailer makes a narrower track and the trailer is hardly a burden, even when loaded with equipment. The lower section holds a tripod and several lightstands. The upper platform holds the camera and lighting gear. This is the rear view of the trailer – the rear panel is an interchangeable placard. For fun, I created an interchangeable placard that fits inside the back frame of the trailer. I can easily change the placard to display different messages, depending on my mood at the time. When possible, I plan to use this rig to go to photo assignments. Naturally, distance, weather and personal safety will dictate the times I’ll use it. I have already used it a couple of times and I believe there are probably a lot more opportunities than would originally come to mind. There are some other errands that I can take care of on a bike as well, if I plan ahead well enough. 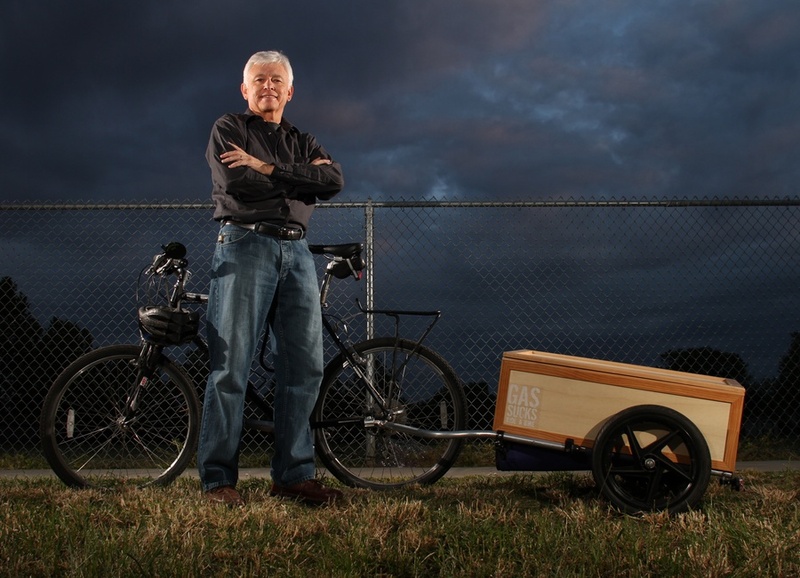 I’m trying to figure out how to incorporate carbon credits into this – perhaps someday I will be able to issue carbon credits to clients who hire me for photo jobs that work well with the bike/trailer rig. I don’t know what a “carbon credit” looks like, do you? Maybe I can just figure out how much gas I’m not using and print up a certificate documenting that and give it to the client for framing. You never know where this idea can lead. So watch for me on the road. Honk gently and wave (with all your fingers) and I’ll wave back – and while we’re on the topic, please Share the Road. Where’s the image? The LCD screen is difficult to see in bright light. For years photographers have used a loupe to check focus on the groundglass of a view camera, or to inspect a negative or slide. A loupe is simply a magnifier for very close viewing. With the advent of digital cameras, a loupe takes on a new role. 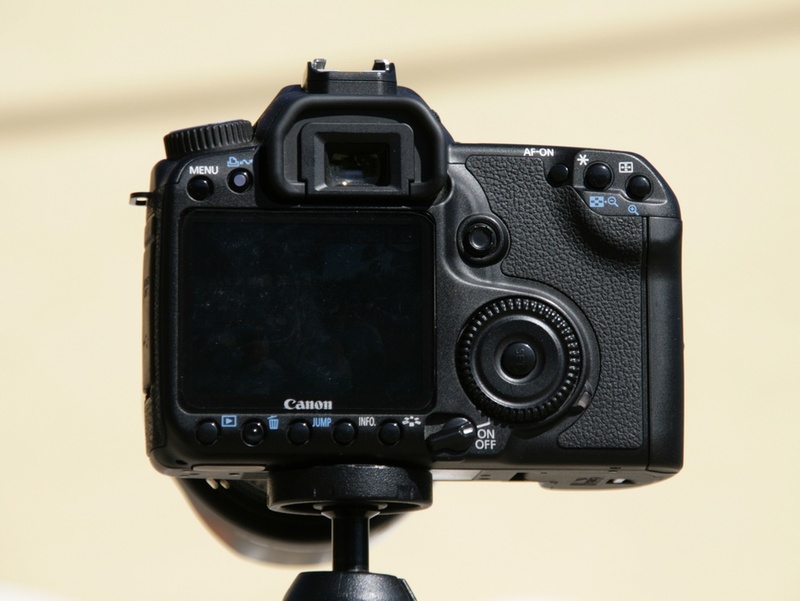 It’s pretty hard to resist chimping your images while shooting; but out in the bright sun it’s almost impossible to see the image on your LCD screen. A loupe can help by blocking out the light while checking your screen. This post will give you step-by-step instructions for building your own loupe. 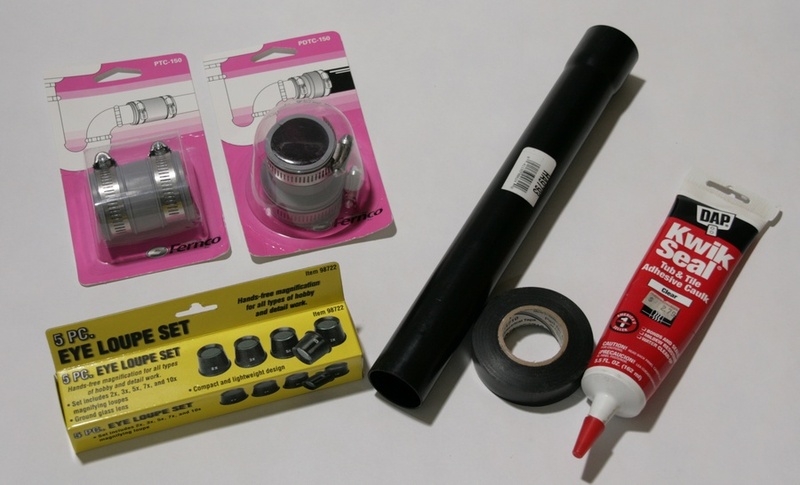 The parts will cost you less than $15 and it takes a little less than an hour to make. The parts to make a loupe will cost under $15. Macro photography – do it yourself! 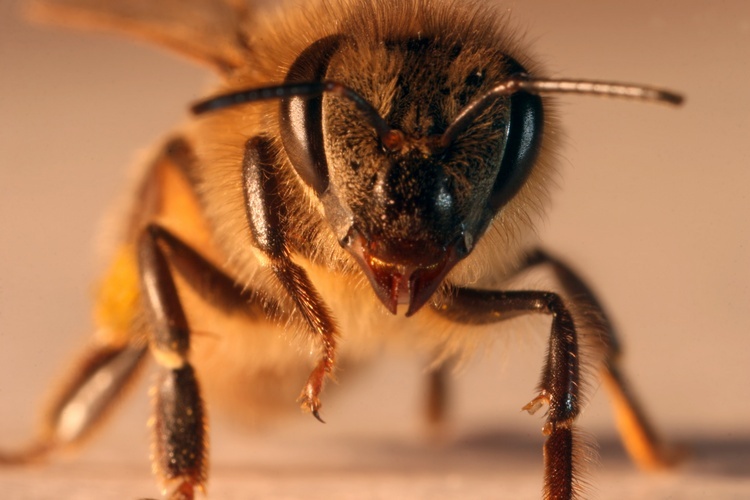 I took this bee photograph with a Do It Yourself macro lens. I bought an old used wide angle lens at a camera store’s junk bin. The lens looks like it was originally made for an older Minolta 35mm camera. The filter size on this lens is 55mm, so I also bought a used filter step-up ring from the same junk bin. The filter ring fits on the front of the lens and has a flat area for a larger round filter. 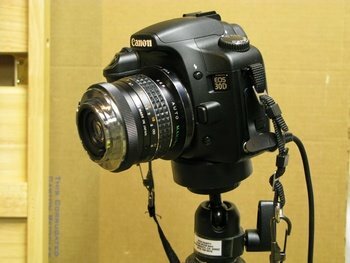 I then took a plastic body cap that fits my Canon 30D camera. I cut out the center part of the body cap and used some JBWeld to glue the body cap to the step up ring. This makes a “reversing ring adapter”. This adapter lets me mount the wide angle lens backwards to the front of my 30D, thus making a very powerful macro lens. I also bought a used 50mm lens with the same size filter mount; this lens is a little less powerful, but still very useful for close-up photography. Total investment: $22 for two lenses and one adapter.